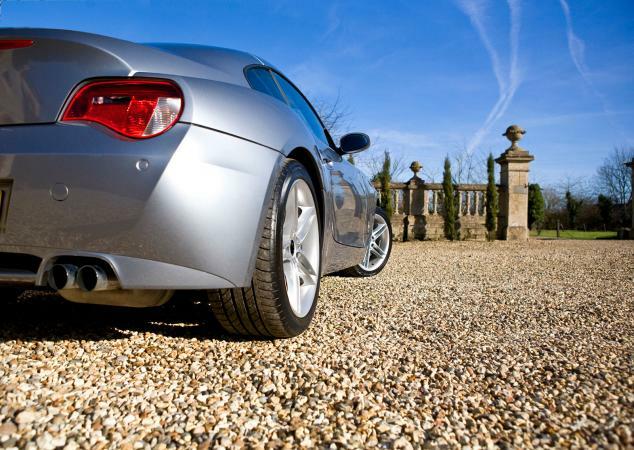 Driveway alarms are a great way to protect your home from unknown vehicles or people entering your property. However, with so many types to choose from, you really need to know what system will work for you. These simple systems use a rubber hose secured across your driveway to alert you when a car is present. It is a great way to single out vehicle activity if you have a long mostly obscured driveway with no power present at the entrance. The pressurized hose needs only a small amount of battery power to send the electric signal to the receiver when your alarm is activated. The hoses are somewhat sensitive to weather conditions but are relatively inexpensive to replace with minimal false alarms due to the pressure necessary to compress the hose. The Dakota 25' Driveway Alert System runs fairly expensive at about $155 but is worth the price according to consumers. The Milton 805 Driveway Signal Bell is inexpensive at $59 and consumers liked the retro sound of the bell. This system mounts close to your driveway and uses the magnetic field of a car to activate the receiver. Magnetic sensitivity singles out vehicle activity on obscured driveways, uses little power for sensing due to its internal magnets and is very weather resistant. Most sensors need to be placed within a 10-foot proximity to the driveway but once installed this system minimizes false alarms due to its magnetic nature. The Dakota 2500' Probe Alert Kit is very expensive at about $240. However, consumers found the product dependability exceptional. 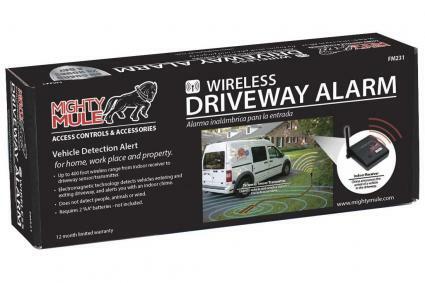 The Mighty Mule Wireless Driveway Alarm is a great price at $70 but consumers found the attached wire to be short. This system sends an invisible beam across your driveway to sense any movement that may cross its path. The sensors can be single for motion detection, or in pairs when they send and receive, but they need constant power for the beam as well as to signal the alarm when triggered. Numerous false alarms can be caused from blowing debris during windy or rainy conditions since the sensors aren't very picky about what crosses their path but they usually have a sensitivity setting to ignore smaller objects and minimize false alarms. 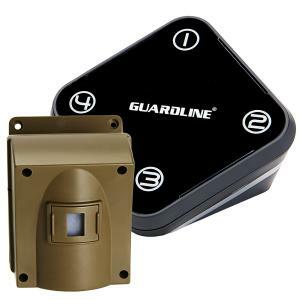 The Guardline Wireless Driveway Alarm has an average price at around $100. Over 1,200 Amazon customers have reviewed and rated this for an average 4+ star review. Customer service was very reliable according to consumers. You might think the Dakota Alert Break Beam kit is quite expensive at around $270. Fortunately, most consumers found aligning the beams relatively simple. These systems detect a combination of heat and movement within the monitored zone. The small units require constant power to sense and send signals to the receiver but one sensor can scan a wide area compared to other driveway systems. The combination of heat and movement helps this system detect people and animals behind bushes, trees, and through heavy rain which minimizes false alarms due to blowing debris. Don't place the sensors in warm areas, however, or you may end up with a false alarm. 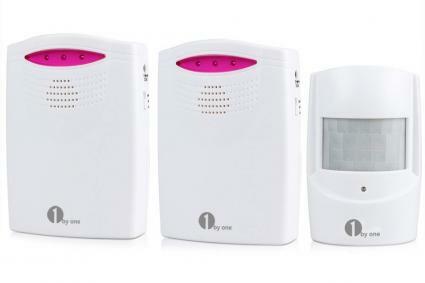 The 1byone wireless driveway alarm is a great price at $25. Walmart customers note the good battery life of the unit. The Chamberlain Wireless Motion Alert System is a good price at less than $80. Customer reviews note that you may need to move the senor around to find the right spot, but it works well and is easy to install once you find it. Multi-sensored networks are a great way to create a secure networked system that makes adding new devices easy using your smartphone. Z-Wave home systems connect different products, from sensors to lighting to window coverings.The systems work with a variety of brands like GE, Samsung, Amazon, Dome, and more. You can remotely control motion sensors, lights, ceiling fans, and even change your homes temperature with a simple app on your mobile device. With networking, sensors are able to transmit much more data and some even help extend the range of your network to reach that small corner of your house but networked systems are often confined within the home, so long obstructed driveways will need to use a long range system. 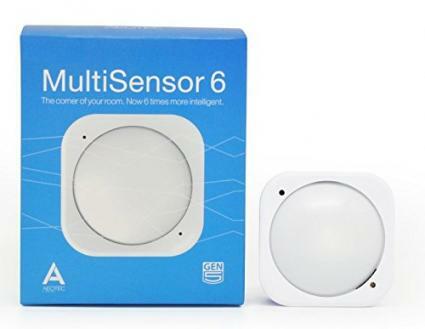 The Aeotec Multisensor 6 is a great price at $60. It's fairly well reviewed, although customers do note the short range (16 feet) for the motion sensor. Many new systems are remotely powered by batteries and some even use solar panels for their detection and transmission needs, but summer and winter homes that are vacant for months may need to have a wired powered system. Running power and sensor lines down the side of the driveway is one way to get power to your system and driveway end lights are a great source to tap off so long as they are on a timer or sensor where power is constantly provided. Downfalls with wired sensors are many. Wires are buried in the ground and can become damaged from animals or the elements, very limited distance from alarm source because of costly wire runs, and digging lengthy ditches to place wires deep enough to prevent their exposure makes these systems expensive both for your back and wallet. However, you run very little chance of accidental trips and you don't need to worry about replacing batteries. With all the great, inexpensive technology available today, you should never leave the responsibility of letting you know someone is entering your property to the stranger outside. A driveway alarm may detract potential crimminals even if you don't have a home security system.